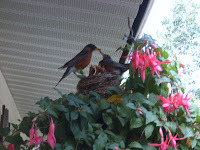 The eggs hatched and the babies are getting big enough to see over the edge of the nest! The babies are just furry mouths to be fed. B&B guests, young and old, are enjoying watching the birds.